Now it's beginning to get brighter! The days are longer and sometimes it almost feels like spring is peeking out. But one should probably expect more snow and freezing temperatures to come anyway. For the children's sake I wish the winter will show itself in time for the winter holiday anyway! Took a picture on the way from home when it had snowed all night. Cosy! January has been amazing beautiful! But cold ... -19 ° I had as the coldest at home. It was smacking in the house at night. I'm glad that the electric power didn't go off. But now it is + degrees and bare ground. February offers a good price on a product of the month! Liquorice is good for you they say. 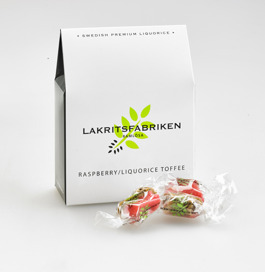 I don't know if it's true - but what I'm certain of is that these gluten-free Raspberry / Liquorice toffees one can really enjoy!